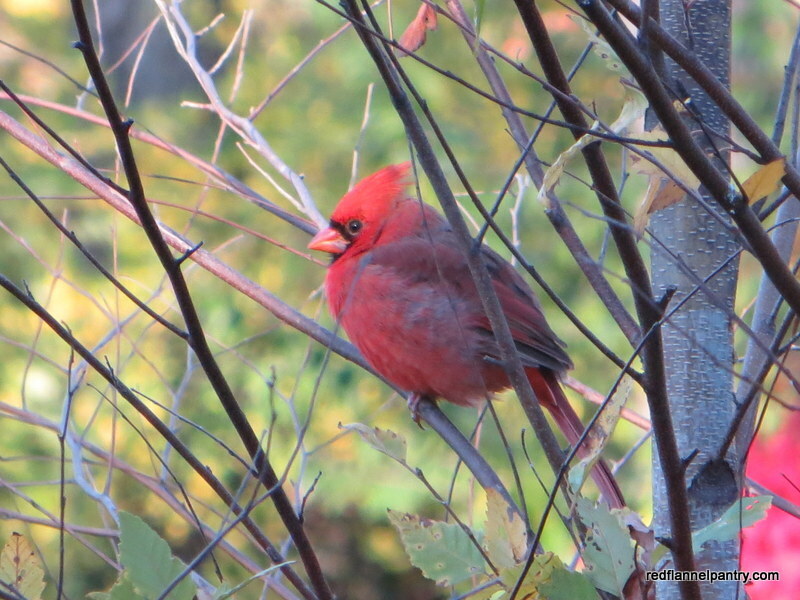 This little cardinal was resting in the river birch outside my kitchen window. 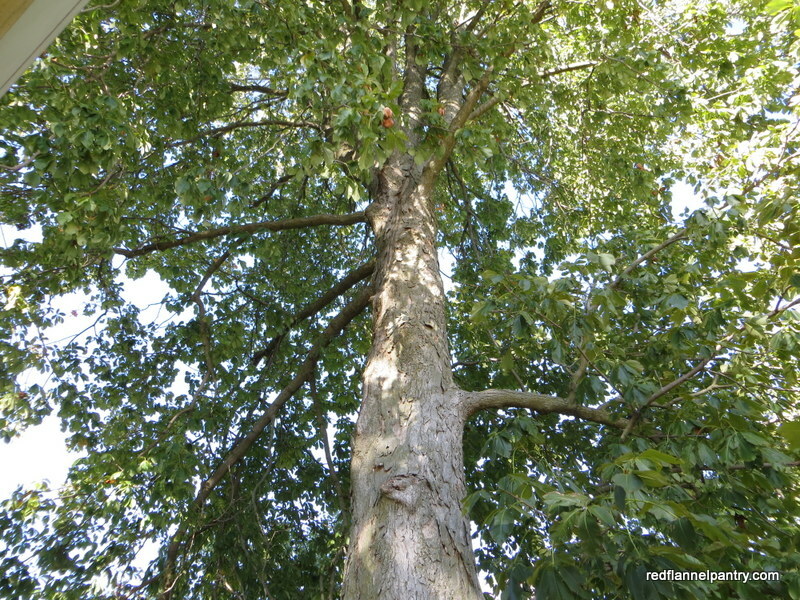 We planted the birch this summer, and the birds now like pausing here before they swoop over to the feeders. We worked on garden chores today. My husband cut back and dug up the canna rhizomes so they could be stored over the winter. 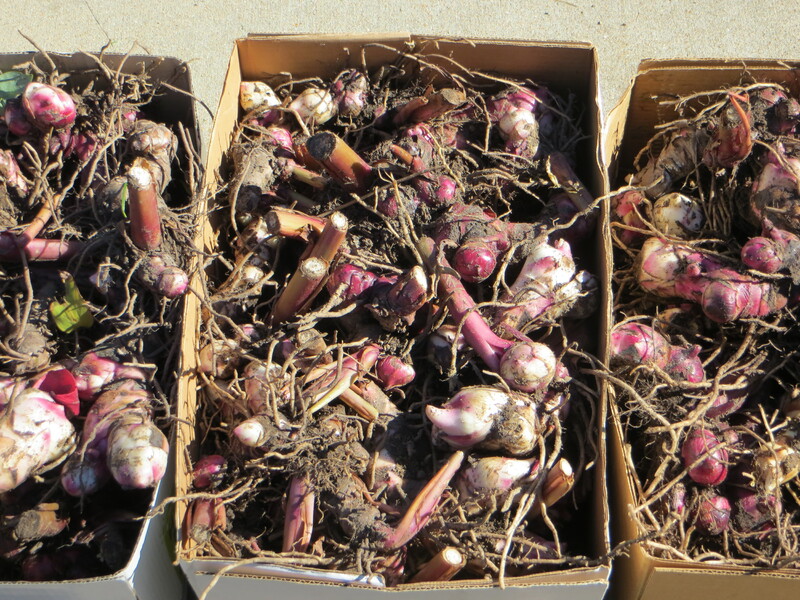 Last spring, he planted one box full of canna clumps; this afternoon, he dug up three boxes full! 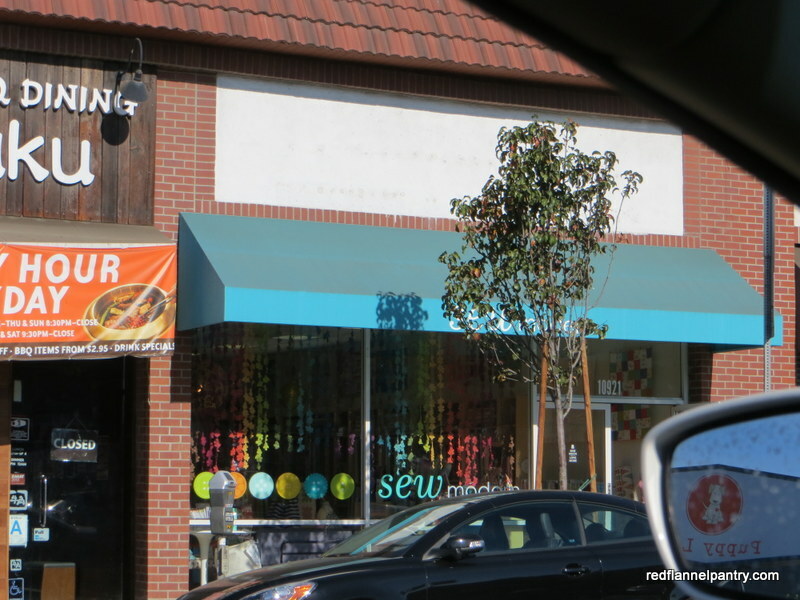 I guess they were in a happy place and feeling prolific. Once they dry out a little, we will store the boxes in the garage till spring. 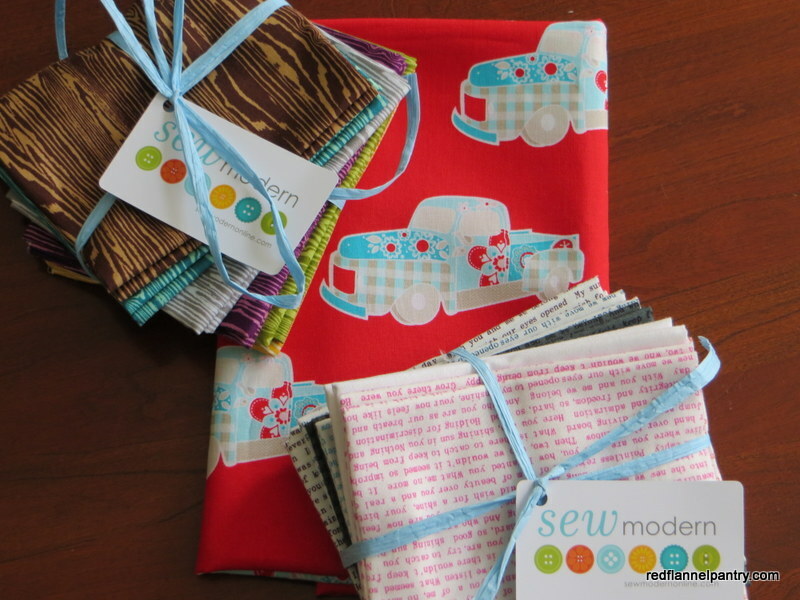 We plan to share them at our garden swap party in May. One of my grandfather’s pet peeves was oxymorons (eg, “jumbo shrimp”); this situation reminds me of one that drove him crazy but seems appropriate: free gift! 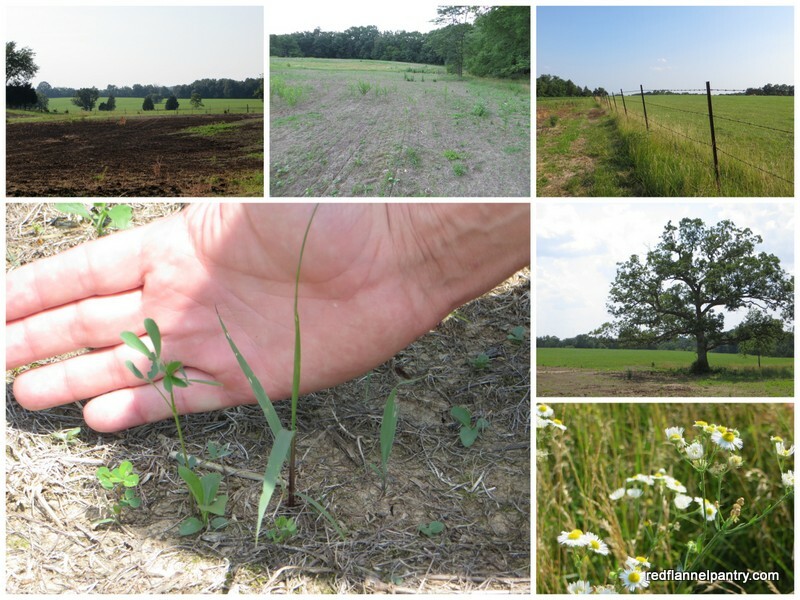 Friends are working to restore some of their farmland to prairie. Over the summer it was exciting to watch the barbed-wire fences come down, the fields controlled-burned and seeded, and the native grasses emerge. 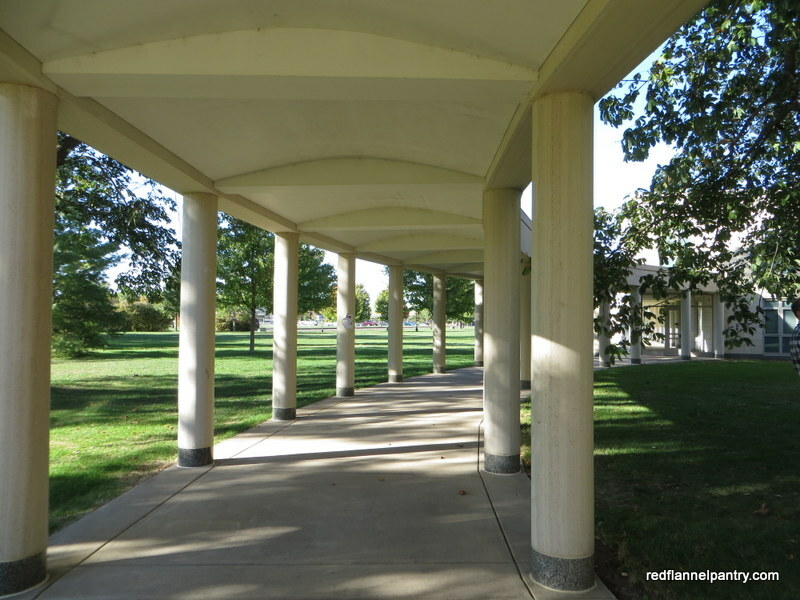 They plan to seed again in December with little bluestem, switchgrass, Indian grass, and side oats grama as well as native wildflowers. Here’s where I am making a small contribution. In my suburban garden, I have tried to incorporate native species to attract butterflies and hummingbirds: coneflowers, blazing star, milkweed, coreopsis. 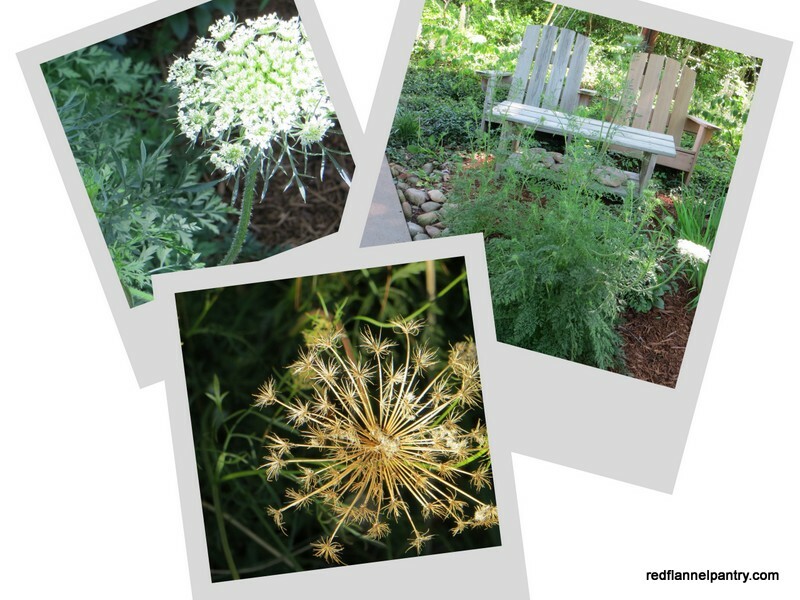 And although it’s not native and considered a weed by many, Queen Anne’s lace is a key player. This plant is tricky: an annual with a long taproot, it’s hard to transplant so is best grown from seed. 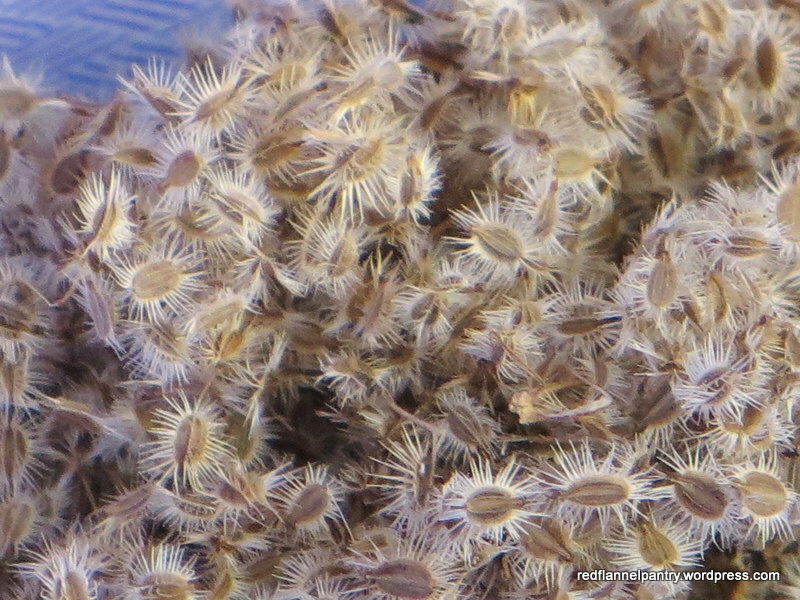 In late September, once the seed heads were dry, I collected several envelopes full of Queen Anne’s lace seed. This seed is a marvel of evolutionary design. Look at all of those little spines–perfect for hitching a ride on a passerby, hanging onto the blade of an established plant and staking a claim in the soil. 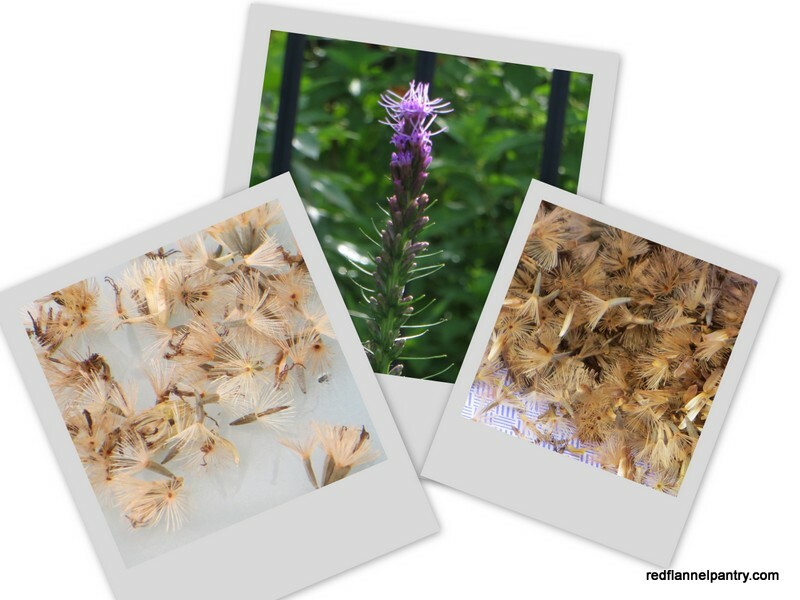 I also gathered seed from my stand of blazing star (Liatris spicata). You can tell by this seed’s inverted umbrella design that it relies on the wind for dispersal. 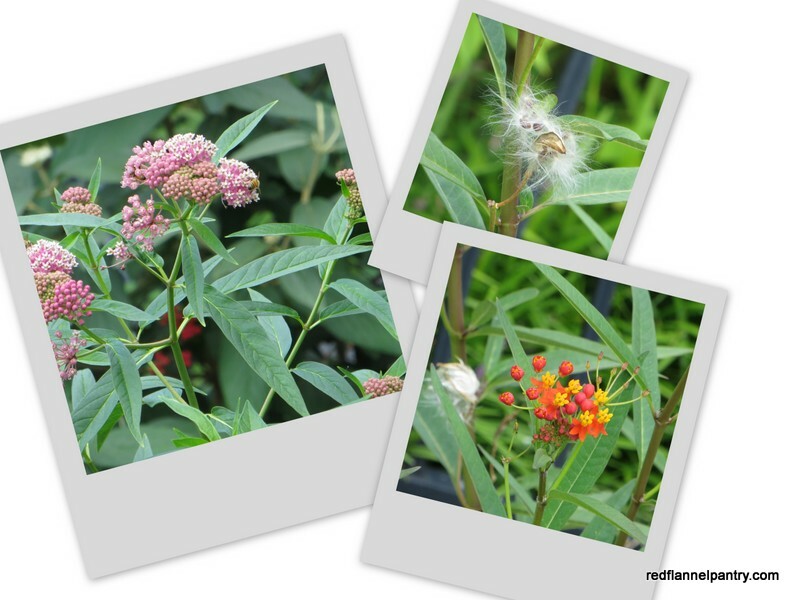 And I collected seed from two varieties of milkweed: swamp milkweed (Asclepias incarnata–pink flowers) and blood flower (Asclepias curassavica–red-orange flowers). Like the blazing star seed, this seed has wispy tendrils to catch the wind, with the seedhead acting as a parachutist. I saved the seed in envelopes and stored them the garage. I just gave the last of the seeds I collected to my friends to add to their seed mix. I look forward to seeing their bit of prairie take root and grow. 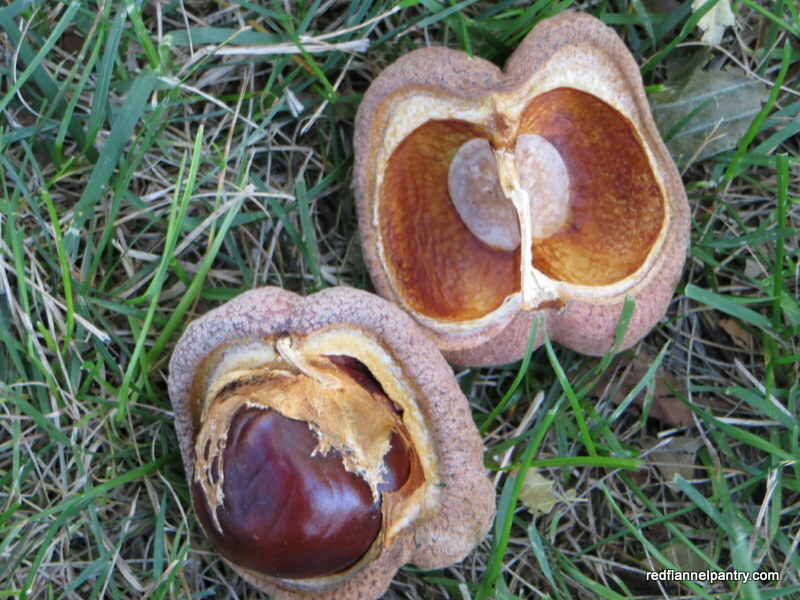 When we were at Grinnell College a couple of weeks ago, my husband and I collected buckeyes from a huge tree on campus (you can read about it here). 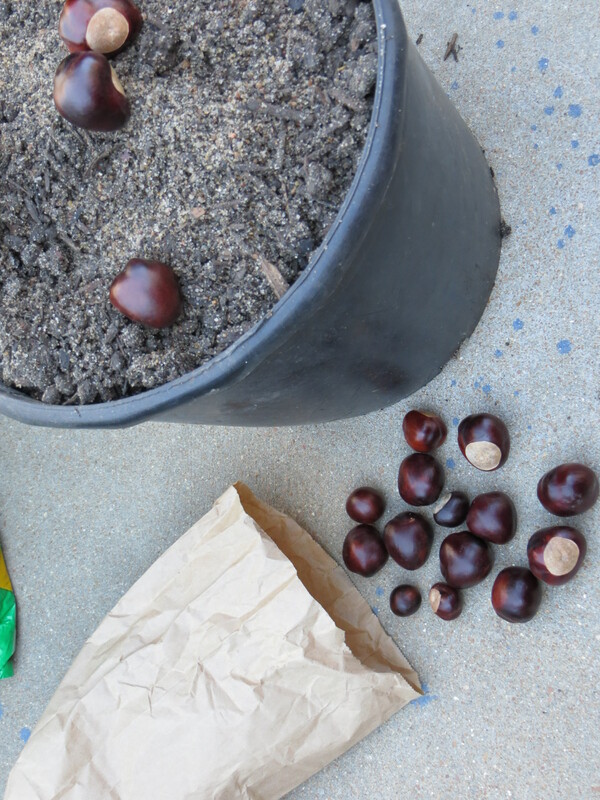 After reading as much as we could find online about planting buckeyes, we decided to give it a try. 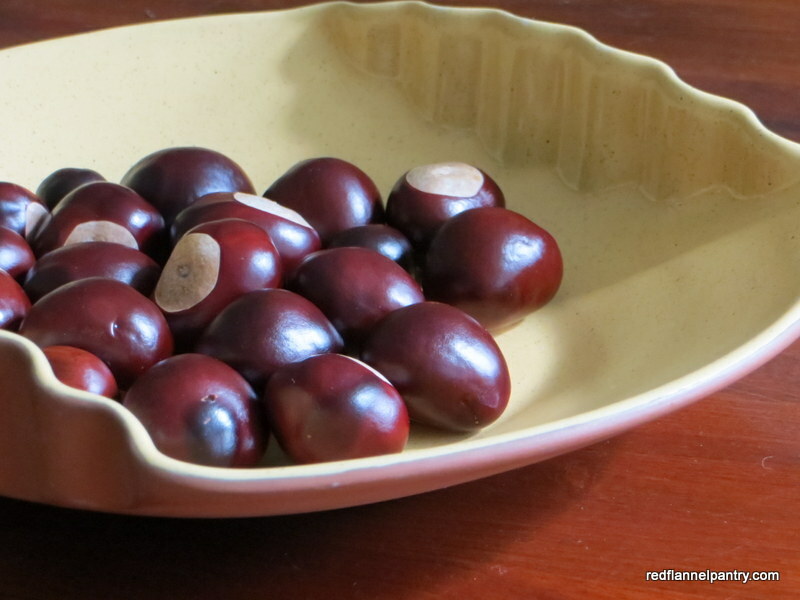 The most important advice was an admonition: do not let the buckeyes dry out before planting them–we hope we didn’t wait too long. Because buckeye trees have long tap roots, we used the deepest pots we could find in the shed. 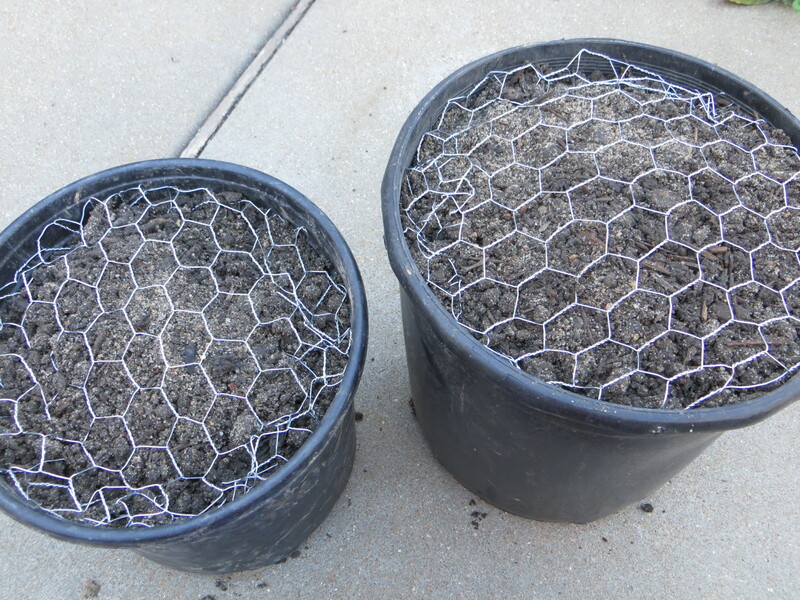 They need well-drained soil, so I mixed about 3 parts topsoil and 1 part sand. Their germination rate is only about 50%–kind of long odds for this gardener!–and the guidelines regarding planting depth were inconsistent. We decided to plant three buckeyes per pot at about 2 to 3 inches depth. Several websites mentioned how rodents like to dig up buckeyes. 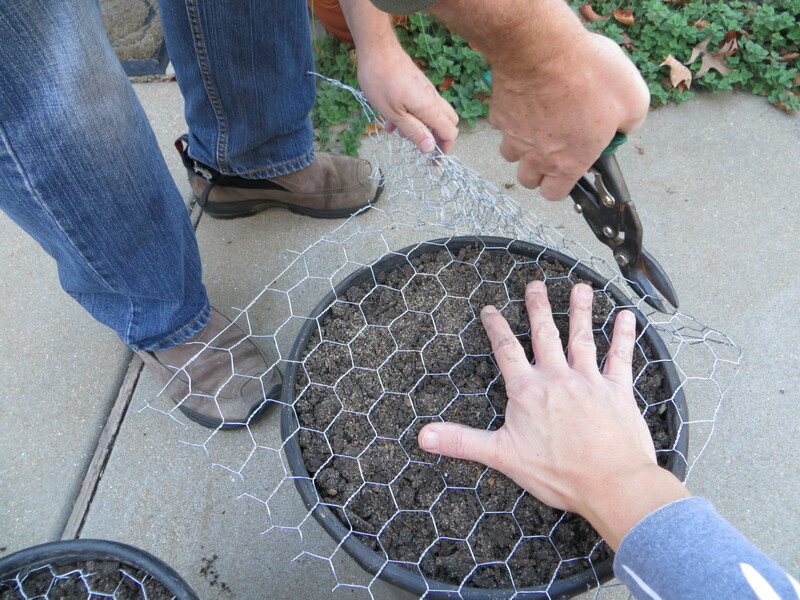 Since the squirrels are fond of doing their own landscape designs in my pots, we cut chicken wire and put it over the top–that ought to do the trick. I am unsure now where to keep the pots: by the back door, which faces northeast and is in shade most of the day? Or by the front door, which faces south and gets several hours of sun? I plan to throw some leaf mulch on top to protect them. In the spring we will see if our efforts were fruitful. 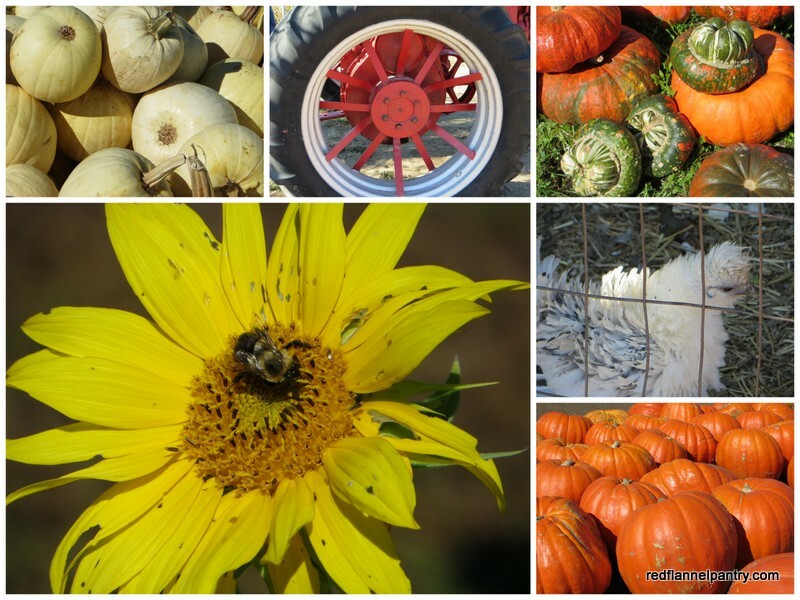 As is our family tradition, we went to Rombachs Farms to pick pumpkins last weekend. Many families made the pilgrimage that sunny Saturday, towing wagons, pushing strollers, and taking photos of ruddy-cheeked children among the pumpkins. 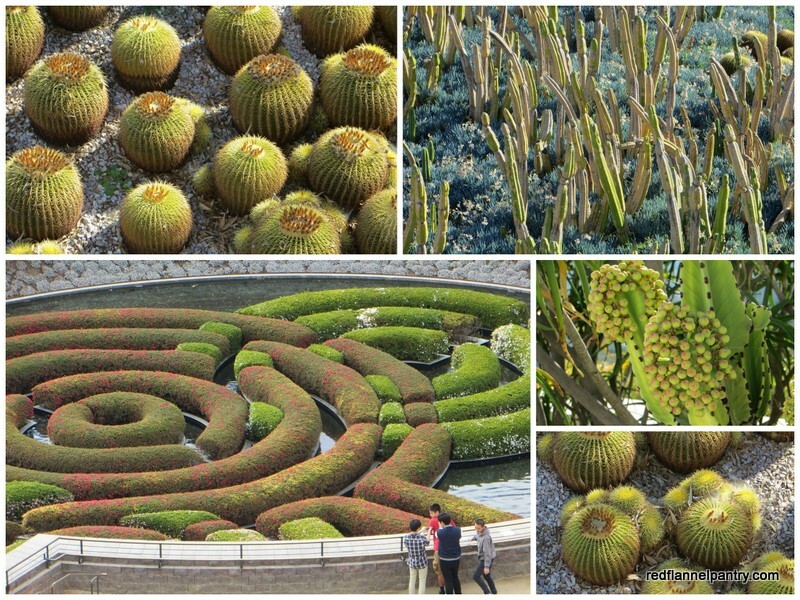 We enjoyed walking through the demonstration gardens. The sunflowers were drooping, looking penitent. 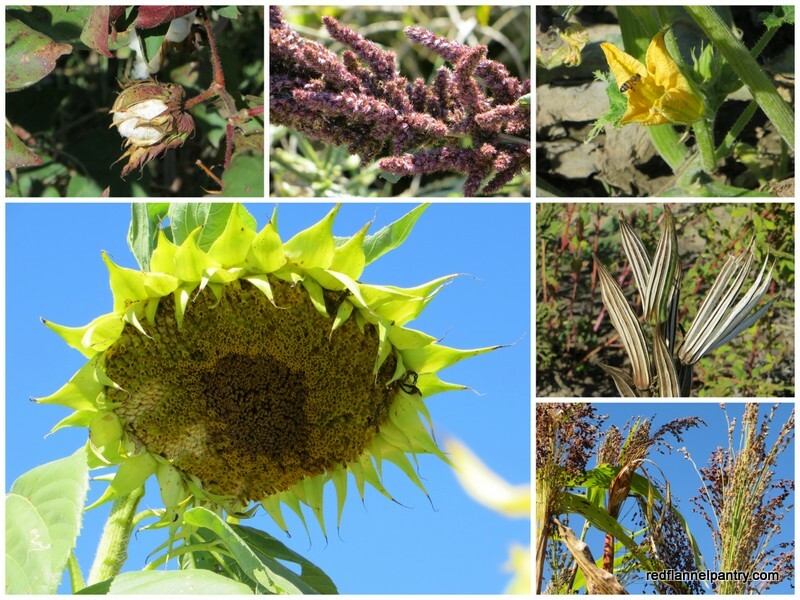 Most everything had gone to seed–cotton, okra, broom straw–but the bees were still at work among the pumpkins. In the pumpkin fields we noticed these low-rise plants with purple, squash-like blossoms. 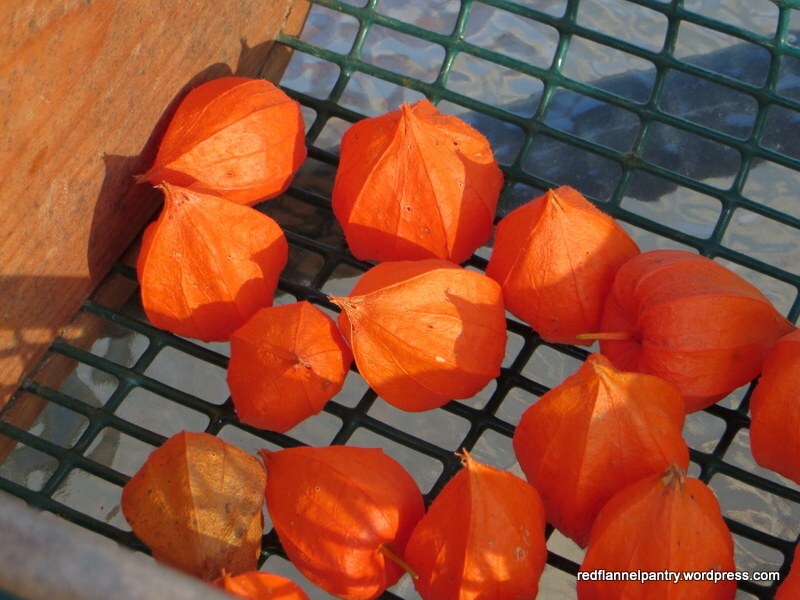 They looked innocent enough, but the seed pods had a menacing appearance. 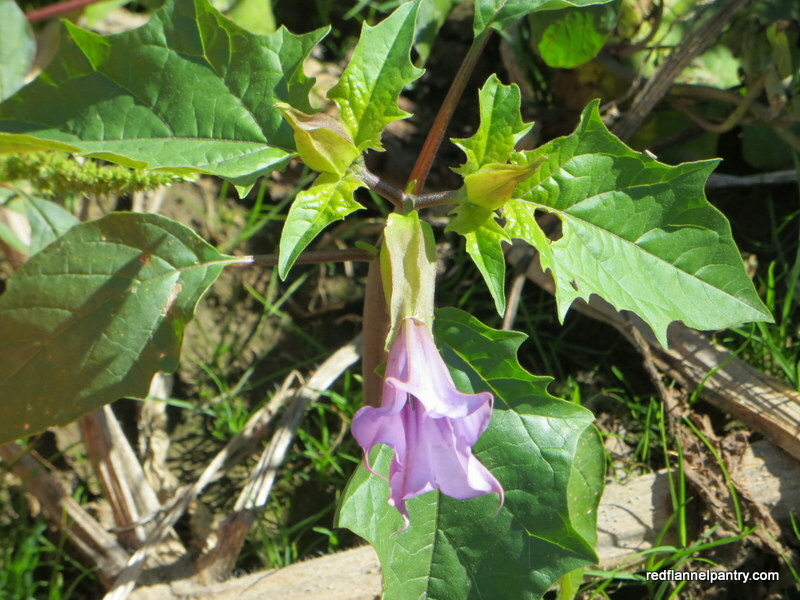 When we got home, I did some research and learned that, indeed, it is a wicked plant: Datura stramonium, aka Jimson weed, a member of the nightshade family. 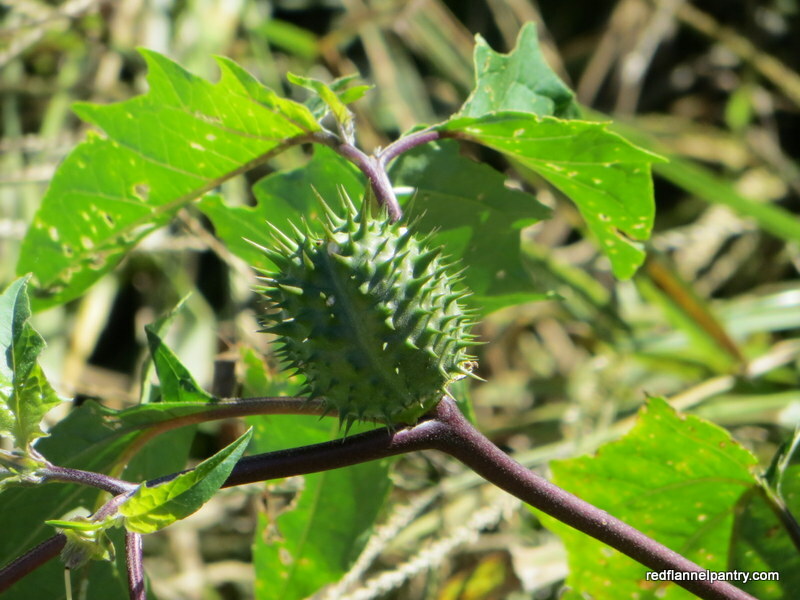 The name Jimson weed is an elided version of its original moniker: Jamestown weed. 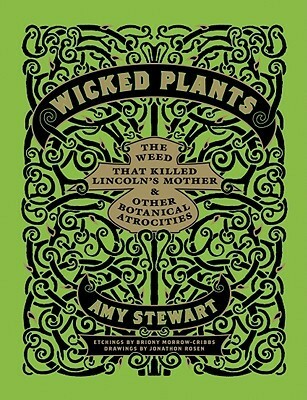 Amy Stewart, in Wicked Plants, explains that some of the first settlers of Jamestown Island in Virginia ate this weed and died horrible deaths. Seventy years later, the survivors and their offspring, remembering the effects of ingesting this plant, fed it to unsuspecting British soldiers when the soldiers arrived to deal with Bacon’s Rebellion. According to Stewart, “the British soldiers did not die, but they did go crazy for eleven days, temporarily giving the colonists the upper hand.” The seeds and the leaves can induce hallucinations, fevers and seizures and cause death. There’s a scary Halloween story for you! This weekend I put the garden to bed. The days are getting shorter and the temperatures cooler. 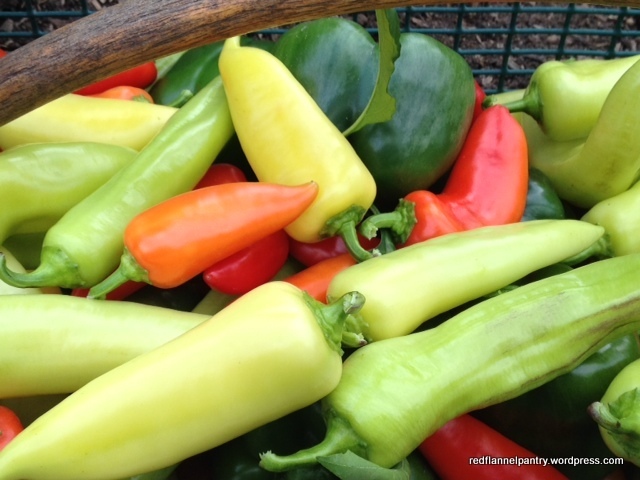 I picked the rest of the tomatoes (even the green ones) and a load of peppers. 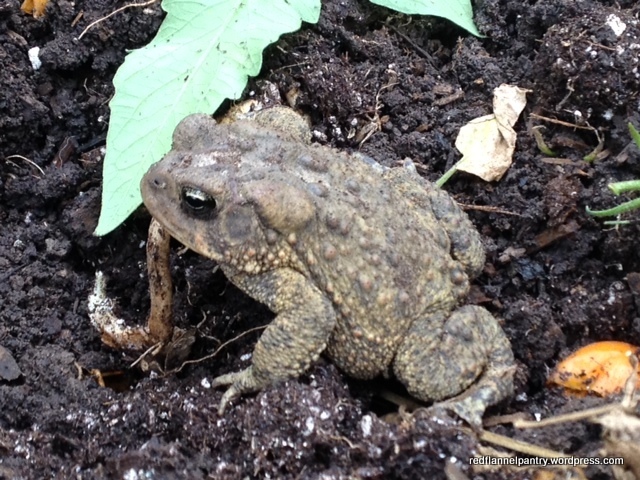 As I began to remove the tomato plants, out popped Mr. Toad. I hadn’t seen him for a couple of months. I think I woke him. 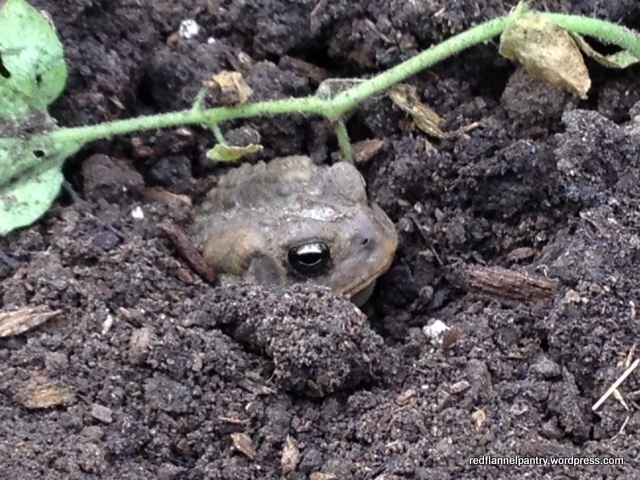 He shimmied into the soil and pretended to watch me work. 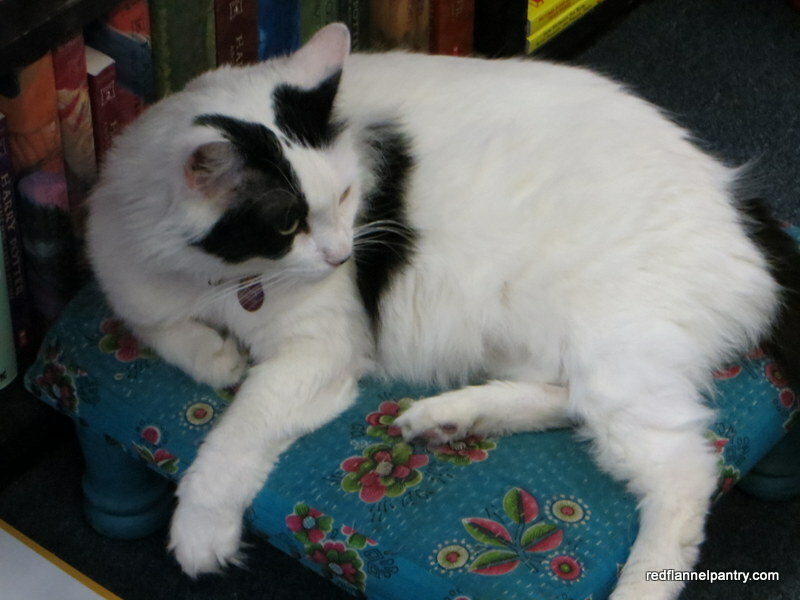 What he really was doing was settling down to return to his nap. 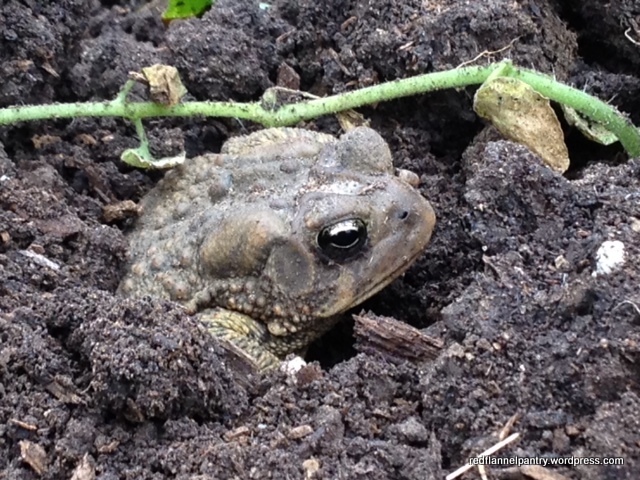 Ever so slowly he sank deeper into the garden until I glanced back one more time and he was gone. 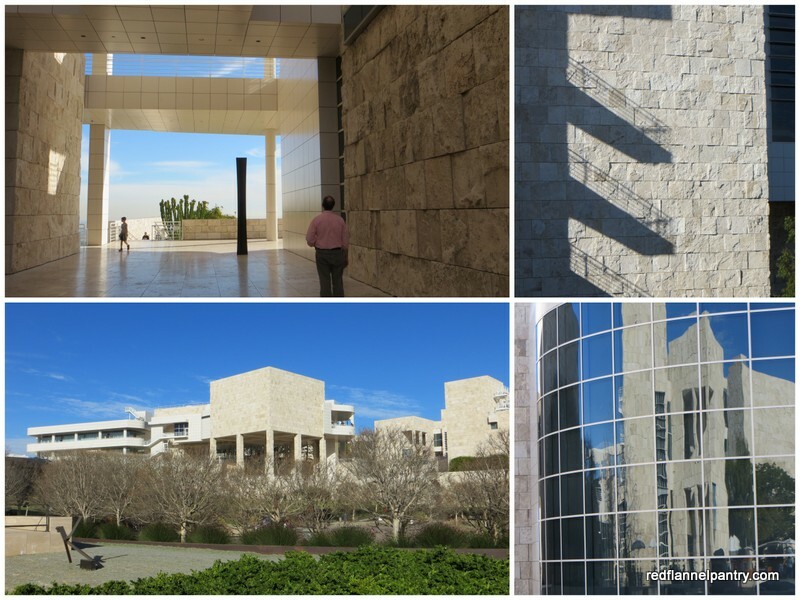 We’ll meet again in the spring. Every spring I visit my favorite nursery, where my friend, Anne, works. 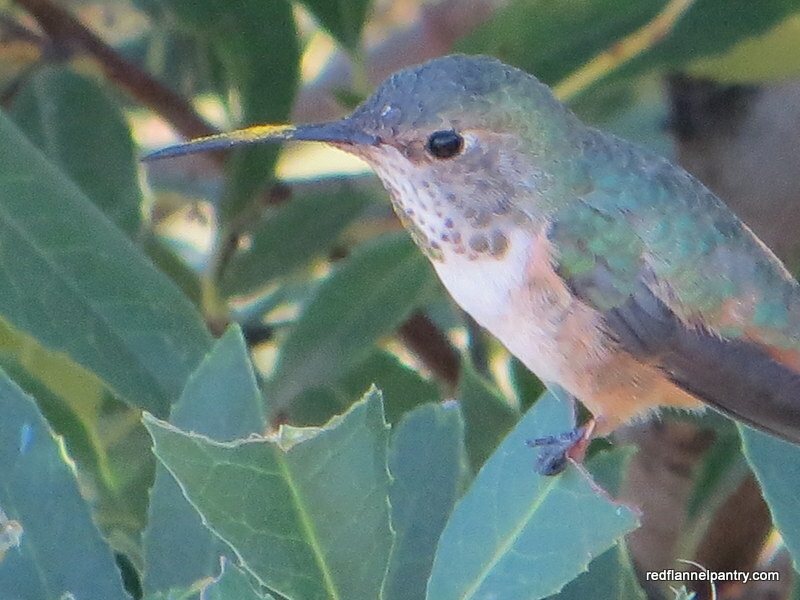 As a knowledgeable gardener who enjoys indulging my garden experimentation, she points out a few unfamiliar plants that she promises will deliver. 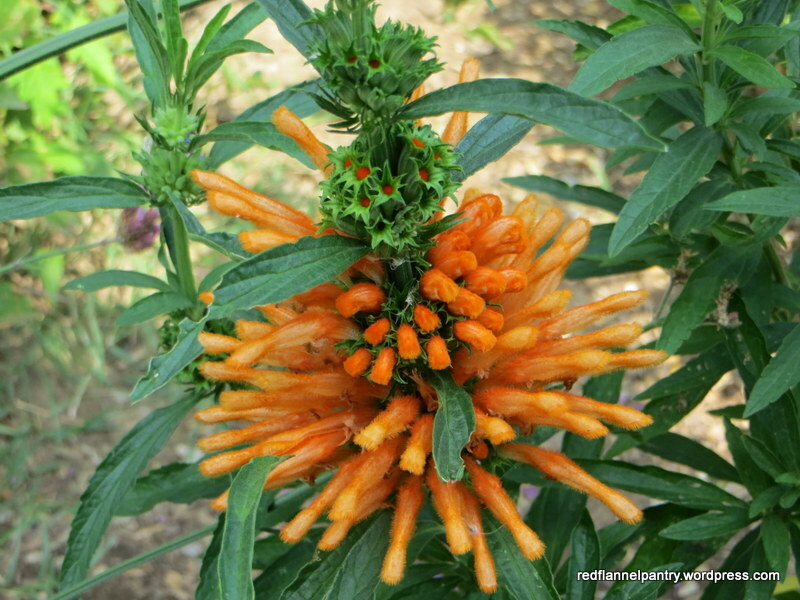 This year she steered me to a plain Jane in the herb section called lion’s tail, Leonotis leonurus. I tended to it all summer, and it has finally rewarded me with these incredible blooms. 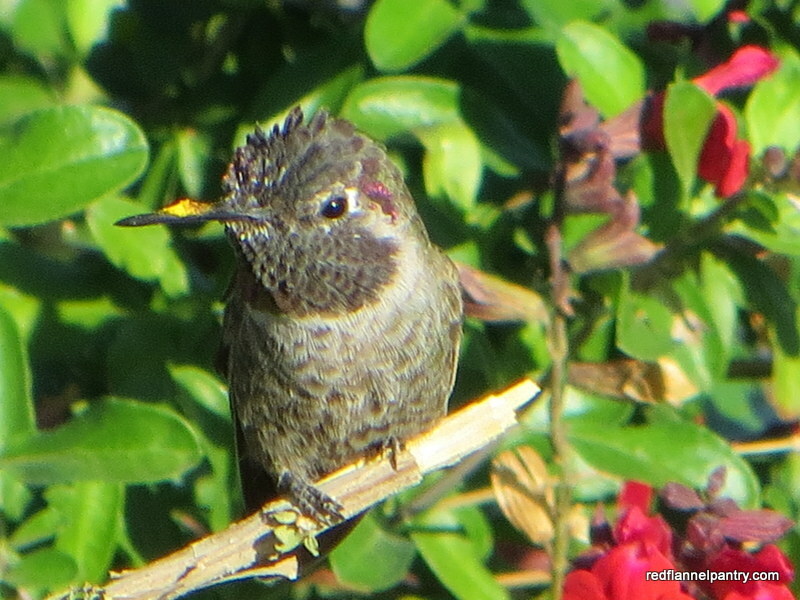 Its tubular flowers are attracting both butterflies and hummingbirds. 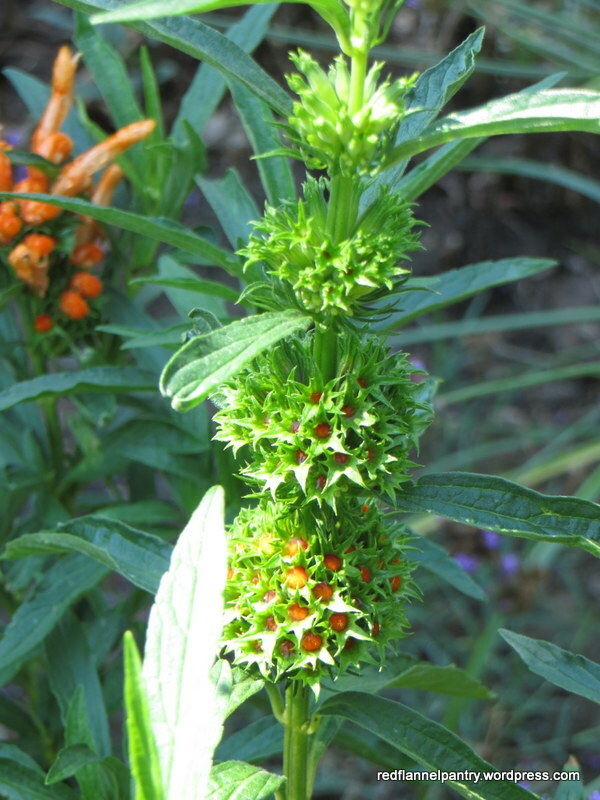 The blooms emerge from these spikey balls. Being a South African native, it is considered an annual here. It’s a member of the mint family and is supposed to have all sorts of medicinal qualities, hence its herbal/pharmacologic classification. 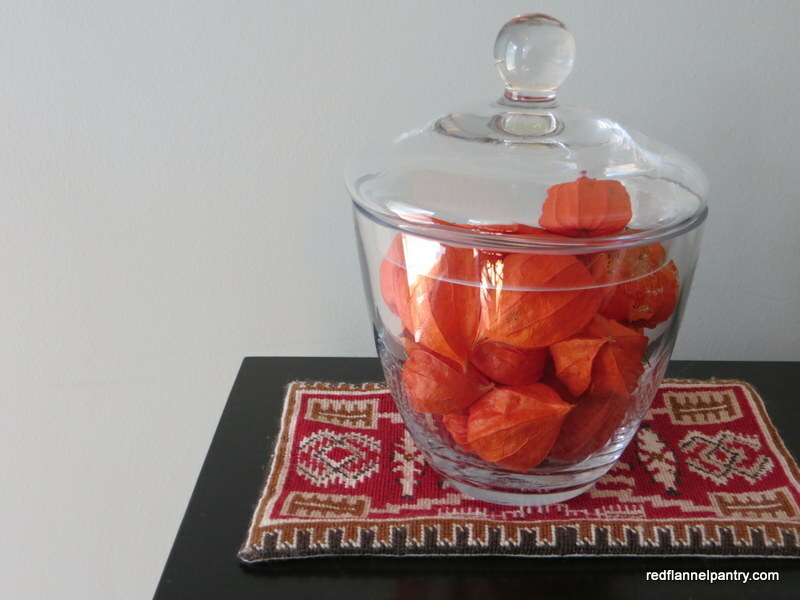 Given my fondness for orange, lion’s tail a new favorite. Thanks, Anne!